For Fine Art and Fine Art Photography categories each entry of a single image must be accompanied by a donation of $25 USD that goes directly to the Center for Great Apes http://www.CenterForGreatApes.org. There is no limit on the number of entries that may be made. Do not submit more than one image of the same Artwork. Cash Prizes totaling $3,250 will be awarded in both the Fine Art and Fine Art Photography categories. First Prize will receive $1,500 USD, Second Prize will receive $1,000 USD and Third Prize will receive $750 USD. Prizewinners plus an invited selection of other entries of significant merit will be exhibited in Miami December 4th-7th, 2019 during Art Week. Letters offering places in the exhibition will be posted to the entrant’s Juried Art Services account by October 30th, 2019. Keep checking your Juried Art Services account for updates. Young Artists with birthdays on or after October 1st, 2000, are encouraged to enter their work in the Young Artists Category. We will accept individual or class/group entries. Please enter jpeg images of your work through the Juried Art Services website checking the category Young Artists. Young Artist entries should be accompanied by a donation of $5 USD for each entry that goes directly to the Center for Great Apes. Please be sure to include your age at 1st October, 2019. Cash prizes totaling $500 USD will be awarded in the Young Artists Contest. First Prize will receive $250 USD, Second Prize will receive $150 USD and Third Prize will receive $100 USD. Prizewinners plus an invited selection of other entries of significant merit will be exhibited in Miami during Art Week December 4th-7th, 2019. Keep checking your Juried Art Services account for updates. 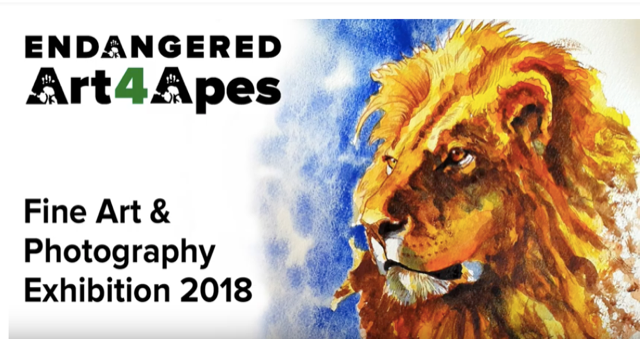 All entries are published on our Facebook page and other social media and on our website at https://www.Art4Apes.com. We will include your name, the title and All Rights Reserved. If you would like your website and social media handles included, please make sure to include them in your Juried Art Services details. The contest opens 4th February, 2019 and the deadline for submission is 30th September, 2019. We regret we cannot accept entries from residents of CUBA, IRAN, NORTH KOREA, SUDAN, SYRIA, Puerto Rico, Quebec AND WHERE PROHIBITED by law. Prizewinners plus a selection of entries of significant merit will be invited to exhibit in the ENDANGERED Fine Art & Photography Exhibition, December 4th - 7th, 2019, during Art Basel Week. Entries will be selected based on the jury panel scores and according to how the work fits in the space available and in the context of a coherent, curated exhibition. You will receive a letter concerning selection of your entry or entries to the exhibition by October 30th, 2019. This will be posted to your account with Juried Art Services. Please remember to check for mail in your JAS account!